These are a perfect size for a snack, possibly a small “meal”or …side dish? As I’ve mentioned before, I’ve started to notice that companies are buying each other, taking over familiar brands. 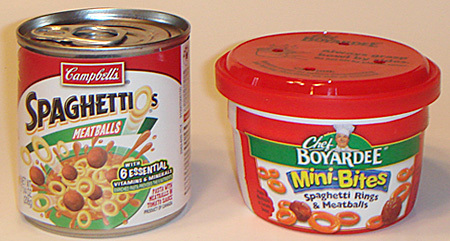 Spaghettios, formerly made by Franco American, are now owned by Campbell’s (who also powns Pepperidge Farm, Prego, Pace and Swanson). Not that it’s a snack, but I thought it was semi-interesting that the only product Campbell’s still allows the Franco American label on is their jarred gravy. In this evaluation we had the help of our friends Sara and Mark. I could only find an equivalent from Chef Boyardee with meatballs so that’s why we tested the meatball variety. Sara noted that the pasta had no flavor and seemed just be there for texture in the sauce. On that note, we didn’t feel the sauce had that much flavor either although it was pretty sweet, not exactly like ketchup, but similar. It was also kind of soupy. We noticed that the meatballs were squishy and tasteless. Not the worst thing in the world, but it was just ok. The first thing we noticed was that the sauce was much thicker. 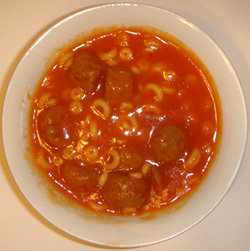 The meatballs were firm and had more flavor than the Spaghettios. Mark pointed out the sauce had a much stronger tomato taste and I thought maybe they put more tomato paste in it to give it flavor and thickness. The pasta was a little chewy but held on to the thick sauce nicely. Hats off to the chef. 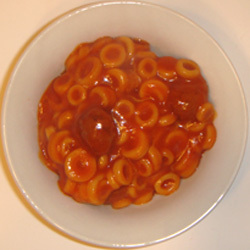 Both of these were pretty much what we expected, but the “heartiness” of Spaghetti Rings gave it the edge over the soupy and bland Spaghettios. I thought maybe Chef B made a better product because his menu is more expansive with such notable dishes as “Beefaroni”, “Lasagna” and “ABC’s & 123’s” but I guess they’re all the same thing in different shapes. Oh I’m a sucker for the Chef! Love him to bits – but I do remember him tasting better when I was younger LOL. Both Entenmann’s and Freihofer are owned by George Weston Bakeries of Canada. Many of Freihofer’s non-bread products are made in the Entnmann’s bakery. (I’m not sure where the cookes are made, however.) A lady at a Freihofer outlet once told me all they do is adjust the ingredients a little bit when switching over from a Entenmann’s production run to a Freihofer production run. Spagettios used to be good. Until as you mentioned. Campbells took them over. Now they just taste like tomato soup with a bunch of noodles thrown in. Don’t know about the Chef Boyardee one. Never liked anything he had to offer anyways. Spaghettios is better. On the other hand,I’ve never had Chef Boyardee Spaghetti Rings. Chef n products all leave an after taste that was not there while under Franco American also an off brand I tried in Minnesota was awesome too bad they not in Seattle. Been eating spagettios since I was a kid, it’s still my favorite even dealing with the after taste. I Loved Franco American to me it always had the BEST taste of them all. Sadley when Cambells changed the brand they added GMO cancer causing High Fructose Corn Syrup into it basically making it to dangerous to consume so I stopped eating it years ago. Wish they would bring it back, I miss it. ?